GoodBooks.com asked me to try out two of their slow cooker cookbooks, and I have spent the last 6 weeks dutifully slaving in the kitchen. Or not. After all, the reason I said I would review the cookbooks is because crock pot cooking is about the only kind I do during the cold months (and in the warm months Husband works the grill most nights). Throw in a protein, some veggies, a few more ingredients and seasonings -- and here's the hard parts -- put on the lid and turn on the switch. Walk away for several hours. Soak up the compliments from your family members when they walk in the house and assume from the aroma that you've spent all day preparing to nourish them. Serve up a delicious meal that requires minimal cleanup. Bask in your heroism. Like I said, slow cooking is my kind of cooking. Pour water into 2 qt slow cooker so it's half to 2/3 full. Add all other ingredients. Stir well. Cover. Turn cooker to High until mixture boils. All were simple enough for school-age kids, who get exposure to measuring, fractions, cooking technique, project management, and lots of Velveeta. 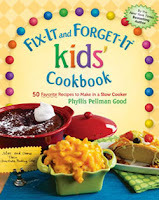 GIVEAWAY: GoodBooks.com is giving away one of these slow cooker cookbooks to a commenter. Leave a comment below by December 22 and random.org will pick a winner. The comment must indicate which of the two books you'd most like to have, and should include your email address in case you win. You can get extra entries with a tweet, a Facebook status update, or a blog post that links to this post. Random.org spit out #12, so Alison, you win the Fix-It and Forget-It Christmas Cookbook. EMail me your mailing info within a week (Lori at WriteMindOpenHeart dot com). Congrats, and don't forget to invite me over for dinner! i need some SERIOUS help with cooking for my crazy picky eaters. this book sounds perfect! Wow. These both look amazing but I've never heard of slow cooker recipes for kids. That would be soooo helpful because as a working mom it's so hard to whip something up at 6pm for hungry tykes. Thanks for the chance! I love using slow cookers for meals - especially in the winter months. I am always trying to get my kids to help with meal planning and preparation - not because it makes things easier on me but because I find that the more involved they are the more likely they will eat what's for dinner. Ahhh, a peaceful meal with no complaining and clean plates! Can't wait to try this kids cookbook! I'd pick the Fix-It and Forget-It Christmas Cookbook. I'd take the Christmas one. I love my slow cooker but I don't know what to put in it! 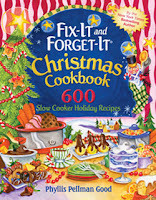 I would love to have the Fix-It and Forget-It Christmas Cookbook. The Christmas Smells recipe sounds fabulous, even if you can't eat it! oooh! the Christmas book looks awesome. Thanks! I would LOVE the kids one! Ihave a picky eater wirh allergies. I can modify most any recipe I find... It's finding the recipes! I LOVE crock pot cooking...and little prep time, delicious smells, and lots of compliments, etc. If I win, I'd like the Christmas, "Fix It And Forget It." I would really like to win the Fix-It and Forget-It Kids' Cookbook. I would love the Christmas book. I just got a slow cooker for an early Christmas gift and I need recipes!